With the holiday season now in full swing, it’s only a matter of time before you and your family embark on the yearly exodus to your favourite local destinations. More often than not, these family trips involve long hours of driving and over hundreds, if not thousands of kilometres. Besides being physically and mentally ready, it’s also important to make sure that your vehicle is in its top mechanical condition. What’s equally as crucial is the condition of the car’s tyres, because it’s literally the only component that meets the infinitely variable surfaces of Malaysian roads. Remember, the actual contact patch between road and tyre is only as big as a postcard, so this aspect of car care is not to be taken lightly. In fact, tyres provide four critical functions: it supports the entire weight of a car (which can easily weigh over a tonne with an entire family, even for a Perodua Axia), absorbs road shocks, transmitting traction and braking forces, as well as overseeing the changing and maintaining of driving direction. So, before you hit the ground running, here are some simple tyre care tips, courtesy of Bridgestone. Firstly, air pressure. Did you know that a tyre naturally loses air pressure by 10 to 20 kPa a month? This is why it’s recommended to check your car’s tyre pressure every month or so, and be sure to do this when the tyres are cold (driving after long periods increases tyre temperature due to friction, which causes air inside to expand) to get the most accurate kPa reading. When filing up air, simply refer to the manufacturer’s recommendations on the inside of the driver’s side door. If your car comes with a spare tyre, fill that up as well. If you find that your tyres are leaking are quicker than normal, consider checking for punctures, or use a soapy solution and pour over the tyre valve to check for leakage. Bridgestone recommends using nitrogen gas instead of regular air, because it’s less prone to leakage and therefore improves fuel economy and manoeuvrability. It’s a luxury if you ask us, but using nitrogen poses no harm anyway, so to each their own. More importantly is tyre wear. We all know it’s dangerous to drive around with worn tyres, yet many choose to be apathetic and turn a blind eye. There’s absolutely no advantages when driving on worn tyres. 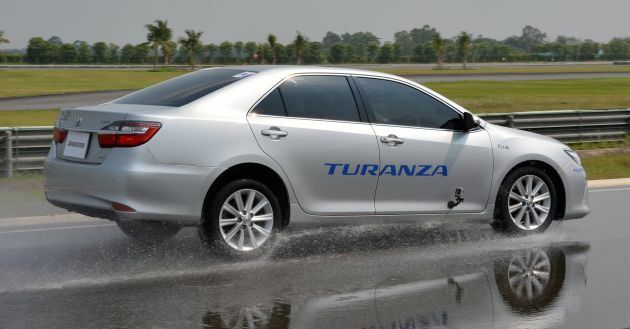 As a matter of fact, you’d be putting you and your family at risk, especially during this monsoon season. You know, aquaplaning and stuff. Most modern tyres come with tyre wear indicators, which appears when the tread is worn down to 1.6 mm. At this point, the rubber compound is more prone to damage such as cracking or swelling, which could lead to bursting. Driving on worn tyres also significantly reduces traction and lengthens the car’s braking distance, so it’s imperative that you pay attention to tread wear. If you want to risk nothing, you could always replace your tyres. If budget is a concern, we recommend buying a new pair of tyres (preferably of the same brand and model) and fitting it to the rear wheels. This provides better control during emergency braking or when the roads are slippery, and the risk of losing vehicular control on wet surfaces is lowered. It doesn’t matter if your car is front- or rear-wheel drive – it benefits both the same. Another noteworthy precaution is to send your car for wheel alignment and balancing. This ensures that your wheels and axles are correctly aligned while driving, and prevents uneven or irregular tyre wear. Also, never mix tyres even if it’s from the same brand, because every tyre is designed to perform differently. Always make sure all four tyres are of the same brand and model. Other than that, we urge you to check that all lighting instruments, from the headlights to turn signals and brake lights, are all in proper working condition. Oh, don’t forget to pay close attention to that fuel gauge, too! As a little nugget, having your tyres properly inflated could give you up to 3% better fuel economy. A little goes a long way, they say. 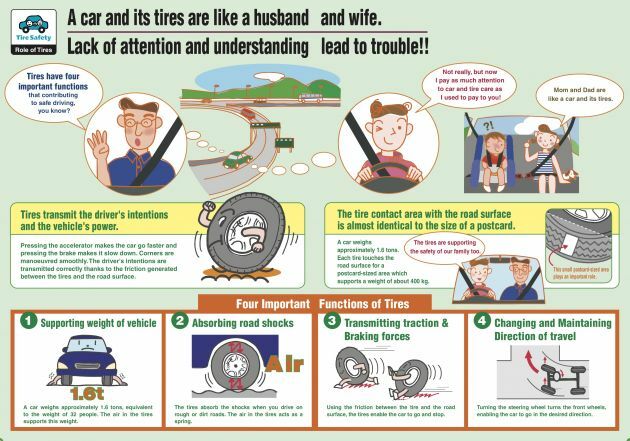 For more information about tyre maintenance and driving safety tips, click here. Happy holiday, folks, and drive safely! Harvinder Singh Sidhu thinks there's nothing better than Formula 1, not even sliced bread. Having written about cars since 2006, he plunged head first into the industry out of a passion for all things four-wheeled and everything in between. The F1 enthusiast has been following the sport since 1999 and has been keeping up with it since. In between races he keeps himself busy as the host of the Driven motoring TV programme and as our version of the Joker.